Christmas Favorites [W5726] - $6.00 : Yarn Tree, Your wholesale source for cross stitch supplies. Cross stitch chart from Imaginating. Designed by Diane Arthurs. Nothing says Christmas more then Christmas ornaments, Christmas trees, candy canes, etc! 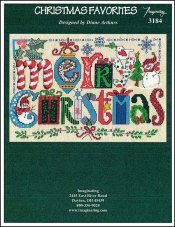 "Merry Christmas" is stitched in the middle of this design with a candy cane for an M, a Christmas ornament for the E, a Christmas present for the R, etc. Stitched around "Merry Christmas," is snowflakes falling & Christmas garland. What a fun & festive design just in time to stitch for Christmas. Merry Christmas! Stitch count 143v x 99h.